Heat oven to 425°F. Brush cookie sheet with 1 tablespoon of the olive oil. Unroll dough on cookie sheet. Cut dough into 6 squares. Roll up edges of each dough square, forming 1/4-inch rim. Pinch corners to resemble rafts. Bake 9 to 11 minutes or until golden brown. Meanwhile, in medium bowl, toss chicken with honey, 1/4 teaspoon salt and 1/8 teaspoon pepper. In 12-inch nonstick skillet heat 2 tablespoons of the oil over medium heat. Add chicken, cook 10 to 15 minutes, stirring occasionally, or until no longer pink in center. Meanwhile, microwave frozen corn as directed on bag. Add corn and bacon to chicken; cook 1 minute longer or until thoroughly heated. In small bowl, toss arugula with remaining 1 tablespoon of the olive oil, 1/8 teaspoon salt and 1/8 teaspoon pepper. 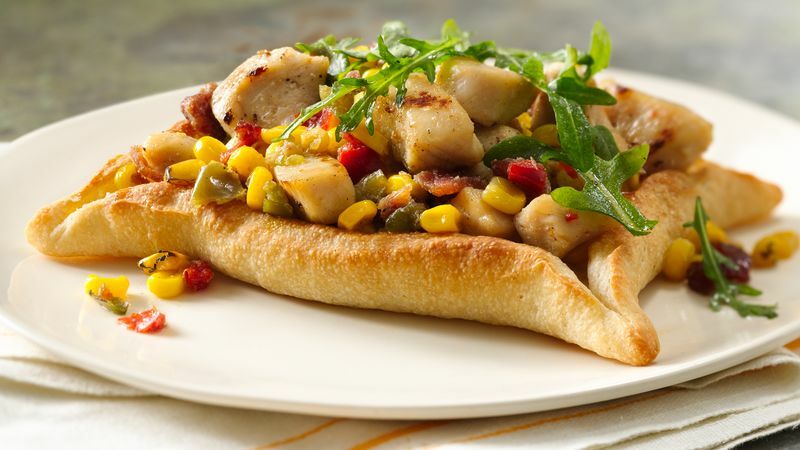 Top rafts with chicken mixture and arugula.